Payment Plans are helpful in letting users pay the full amount in various deposits after specific intervals. Go to Products > Payment Plans to add different payment plans. Create a payment plan under the ‘Add Payment Plan’ column. 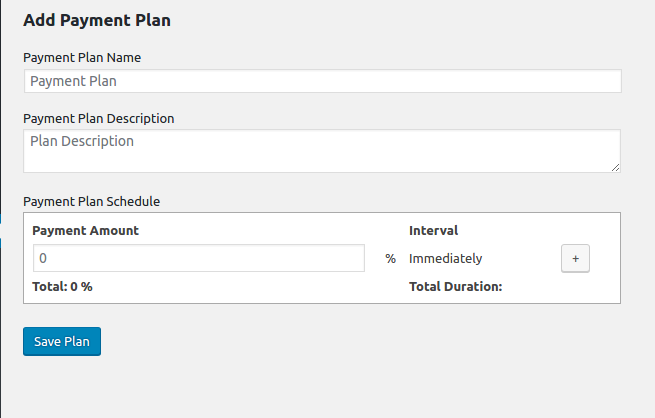 The created plan will appear under ‘Existing Payment Plans’, where you can edit or delete the plan. Let’s create a new payment plan. We will create a 15 days plan where users will pay 30% of the amount while placing an order, 50% after 5 days and remaining 20% after 10 more days. Add a name & description for the plan. Under Payment Plan schedule, select 30% payment amount in the first field which will be paid by the users immediately. Click on the ‘+’ button to add next schedule. Now select 50% payment amount and 5 Days interval. Click the ‘+’ button. Select 20% payment amount and 10 Days interval. Click on Save plan. The plan will be displayed under ‘Existing Payment Plans’. Add this plan in the global or product settings to let the users select it. Once this is done, Invoice Emails for scheduled payments in the payment plans will be sent automatically the customer on the scheduled date.